Boyfriend was super lovely and surprised me with possibly the last one in my size to be found in all of Dublin as a thank you gift. I nearly died. I knew how much they were, I had stared longingly at them for a considerable amount of time at that stage. Also, the fact he remembered - still amazes me but I should give him credit where credit is due, he's actually a brilliant listener with an unreal memory. This makes him an excellent gift-buyer and leads to such wonderful as this iconic J W Anderson jumper becoming mine. It's so warm and cosy, great snug fit and that little bat fellow is just so darn cute! Also Daisey Lowe has one - I had to have one too! What fabulous company to be in. But what's all the fuss about? 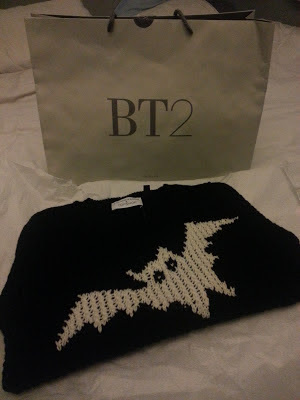 Well, it's not just every day BT2s picks up a Topshop line (this confused Boyfriend greatly) but this was not just any line, is was the beginning of a beautiful friendship, history in the making - any cliché you can think of! But that is, by no means, a bad thing. You would think the Irish media were great for tooting our own horn, and yet it took an British powerhouse like Topshop (and the likes of super-stylish Alexa Chung and my good pal Daisy Lowe ahem) to finally point the spotlight in the right direction. For shame people, for shame - and they're telling us to be proud of our heritage? JW Anderson is Irish, he hails from Co. Derry - everywhere he goes he says he's Irish. His father is Willie Anderson - a certain rugby star who earned 27 caps for Ireland. He bases so many of his designs on the Irish relationship with clothes - stories, sentimentality and the classic Aran jumper. Only recently he won the Emerging Talent Award at the British Fashion Awards - sure he's far passed "emerging" but talent like his is worthy of any and every accolade in my humble opinion. Finally, an on-going theme in my most-loved designers list is men's tailoring for women. Anderson especially plays with men's shirts, varsity jackets and jumpers for women and does it so beautifully. I'm still pining for a shirt dress I missed out on from Topshop. Not only does he mix it up for women, he plays around with his men's line which caused quite a sensation at London Mens Collection. The juxtaposition of female cuts on the male form really shows how he's developing and bending his own fashion rules - and being so young (and darn good-looking) this is definitely a watch-this-space topic. How do you feel about pushing the gender boundaries in fashion? Does it work for women in men's tailoring, but no via versa? Personally, I love it - but that's just me.